What’s Opera Doc? is the most celebrated of all Warner Brothers cartoons, its pandering to high art (the “Ring of the Nibelung” cycle of operas by Richard Wagner) perhaps legitimising a work previously dumped on Saturday morning kids TV (1). But if it is the archetypal Merrie Melodies, it is also the least typical – like Hergé’s penultimate Tintin adventure Vol 714 pour Sydney (1968), this late Chuck Jones cartoon is a reversal and deconstruction of a now-mythic body of work. To confirm this, compare What’s Opera, Doc? to the more “conventional” Rabbit Fire (1951). Both feature Elmer Fudd (“Be vewy, vewy quiet, ha ha…”) following rabbit tracks in a pastoral milieu; both see Bugs Bunny embrace transvestism in order to elude and torment the hapless hunter. In Rabbit Fire, however, as in so many Looney Toons, Fudd (like Warner Bros. relatives Wile E. Coyote, Porky Pig, Yosemite Sam and Sylvester the cat) stands in close relation to human experience, striving and generally failing to grasp an elusive quarry or goal. 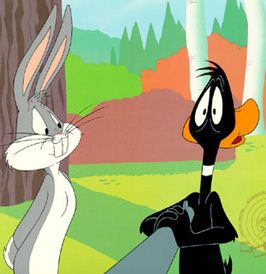 Bugs (like Tweety and Road Runner), whether you see him as Puckish sprite, an emanation of the unconscious, the released libido or polymorphous perversity, or simply a figure of the unattainable, counters the rigidity of Fudd’s ambitions and identity with games, role-play, word-play and metamorphoses (2). The ultimate transformation sees the hunted turn hunter, with Bugs and unreliable ally Daffy mimicking Fudd in costume and accent as, rifles cocked, they chase him across the forest, aware that power is simply an assemblage of props. Boy 1: Sometimes I feel very sorry for the coyote. Sometimes I wish he’d catch him. The exceptional nature of the plot is reflected in the film’s execution and mise en scène. There are nearly twice as many shots in What’s Opera, Doc? than the average cartoon; Jones manoeuvred an extra two weeks of production time to work on it; Maurice Noble’s “monumental designs and daring colour-schemes” broke with studio norms (4). Yet in spite of the impossible reach of the set and the cinematic breaking of the proscenium arch, the film remains true to opera’s theatricality, ringing with noise, shaded by chiaroscuro, emotion all the stronger for being bounded (the film’s most haunting moment: Bugs’ dress floating in brief silence down a vast staircase as he scarpers in vain from his fate). With its fusion of music, drama, choreography, dialogue, song, sets, colour, lighting and sound, Jones and his collaborators forged in What’s Opera, Doc? a Gesamtkunstwerk in monumental miniature of the kind Wagner advocated. Elmer Fudd, often the image of post-war American bourgeois/businessman at leisure, is a crass bully who hunts for “sport”, and yet is unable to cope with the real play offered by adversaries who, like Bugs in Rabbit Fire, can conjure realities (such as an irate elephant) with mere words. Daffy Duck is often a liminal character in Warner Brothers cartoons, sometimes impish tormenter, more often (especially for Jones) frustrated and out-trumped, failing to master or outwit a world of signs and rules erected by unseen others. In Rabbit Fire, shot in the head thanks to Bugs, he finds his vision inverted: “What’s the matter? Everything’s upside down. Strange! Can’t make head or tail of things”. In keeping the joke on Daffy, Jones opts not to show what this might look like, but a later classic Feline Frame-up (1954), centres on problems of vision. Like the previously discussed films, it is set in a circumscribed space, and organised around usurpation and exile. As with What’s Opera, Doc? the film opens on an ideal – here, a small, cuddly cat snoring on a comfy cushion – that is soon undermined: the bigger, sneakier cat Claude kicks it off and takes its place. Thus is initiated a hierarchy of bullying, as each smaller creature is attacked by one that is bigger – Claude is punished by Marc Anthony, a gentle brute of a bulldog, who in turn is reprimanded by the humourless home-owner (perhaps the husband’s irritability in the film masks an insecure masculinity in the “human” realm – not only is his wife constantly “out” while he stays at home, but the marriage appears to be childless: a common anxiety in ’50s cinema). The result of this hierarchy is a failure of clear vision, as each creature busy concentrating on his prey cannot see a bigger foe behind him. When, through Claude’s machinations, Marc Anthony is literally kicked out of the house, his relationship to the idyllic home obviously changes. Where once he snoozed at its centre as top dog, now his view of it is partial, fragmented. He must peer through windows and letterboxes, in the blackness of which we can only see a pair of bulging eyeballs. To regain entry, he must deny his essentially honourable, straight-hitting self, and resort to cunning, sneaking into the house disguised as a shopping package, or smuggling a balloon to open a lock. Unfortunately, integrity is not always synonymous with intelligence, and his one overt attempt at mental calculation, as he tries to measure the cat’s position in the room above, ends in further alienating the homeowner, further destabilising the home. As so often in Looney Toons, the bully is better value than the hero, and Claude’s insolence, malice and sneakiness in the face of canine brute force provide the film’s funniest moments. But with its themes of overwrought domestic violence and suppressed sexual malaise and the use of elaborate frame-within-frame compositions, Feline Frame-up ought to be considered alongside the great 1950s Technicolor melodramas of Minnelli, Ray and Sirk. 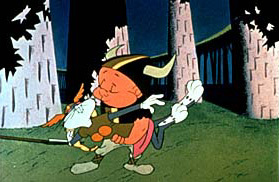 For example, it was the first cartoon entered in the U.S. National Archives; it is the only Looney Toon/Merrie Melodie featured in the recent world cinema survey edited by Geoff Andrew, Film: The Critic’s Choice (Aurum Press, London, 2001); in the Chuck Jones entry in Chambers Biographical Dictionary, ed. Magnus Magnusson (Chambers, Cambridge, 1990, p. 793), only What’s Opera Doc? is referred to as “classic”. On the other hand, no Jones film has yet featured in the ten-yearly Sight and Sound Critics’ Top Ten poll. “I don’t ask questions, I just have fun”: Bugs in Rabbit Every Monday (Friz Freleng, 1951). A previous attempt by Elmer to break the pre-ordained pattern, in Bob Clampett’s The Big Snooze (Robert Clampett, 1946), also resulted in trauma, in this case a mise en abyme of consciousness-invading nightmare.